THIS IS A PRETTY AND COLORFUL HANKY! THE OAK LEAVES ARE SHADES OF PINK AND WHITE WITH SOME ORANGE/RUST COLOR ONES FOR CONTRAST. THE LARGE LEAVES IN EACH CORNER ARE VERY PRETTY. HANKY MEASURES 13 ¼” X 13 ½” AND IS IN WONDERFUL CONDITION. ANOTHER VERY PRETTY LEAVES HANKY! 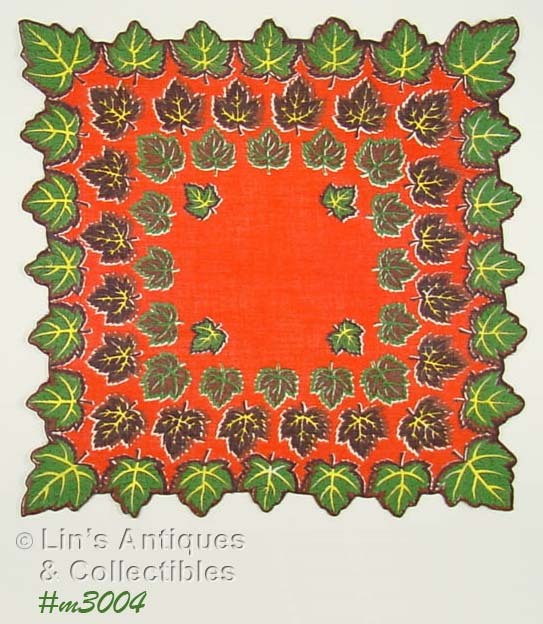 THIS ONE HAS 4 LARGE MAPLE LEAVES WITH LINKED STEMS IN THE CENTER OF THE HANKY. MEASURES 11 ¾” X 12” AND IS IN EXCELLENT CONDITION. ANOTHER BEAUTIFUL HANKY WITH LEAVES! 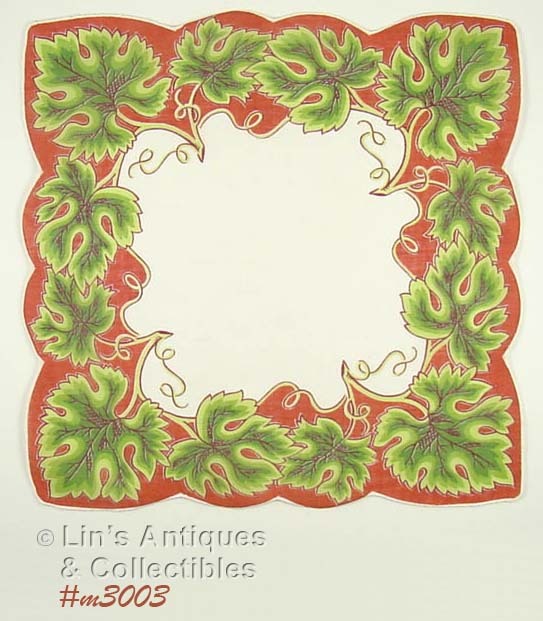 THIS ONE HAS A WHITE BACKGROUND AND HAS OODLES OF PINK AND RED OAK LEAVES AS WELL AS LITTLE ACORNS IN THE LEAF BORDER. 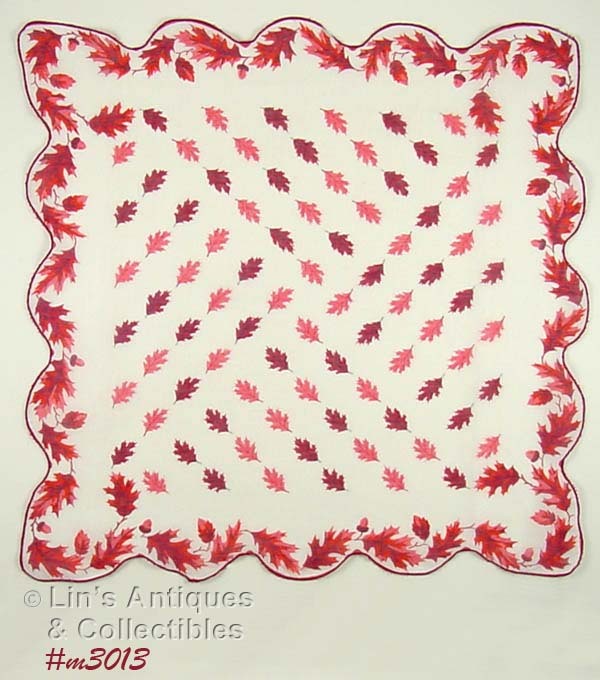 HANKY MEASURES 15 ½” X 15 ½” AND IS IN EXCELLENT CONDITION! THE COLORS ON THIS HANKY ARE MUCH BRIGHTER THAN SHOWN IN PHOTOS – THE NAVY BLUE IS A RICH BLUE AND THE LEAVES ARE VIBRANT AND COLORFUL! HANKY MEASURES 13 ½” X 13 ½” AND IS IN EXCELLENT CONDITION! 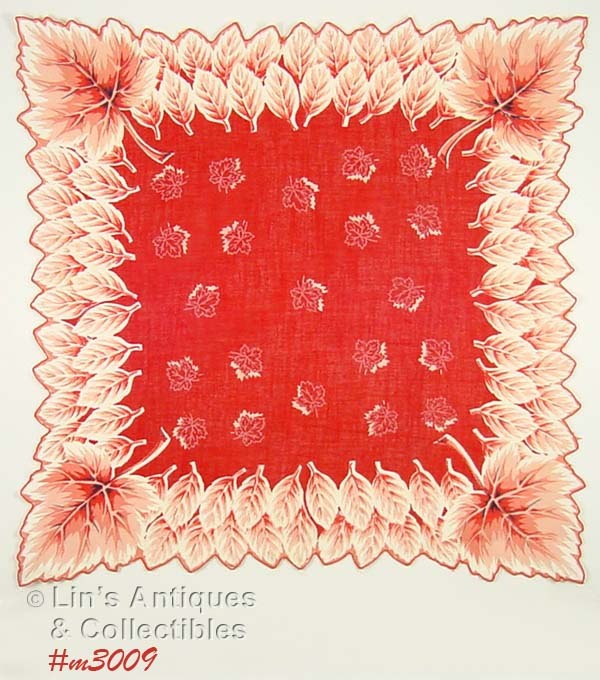 THE COLOR AND DETAIL ON THIS HANKY IS ABSOLUTELY GORGEOUS – OUR PHOTO DOESN’T CAPTURE THE BRIGHT COLOR! HANKY IS THE LARGER SIZE AT 15 ¾” X 16” AND IT’S IN EXCELLENT CONDITION. 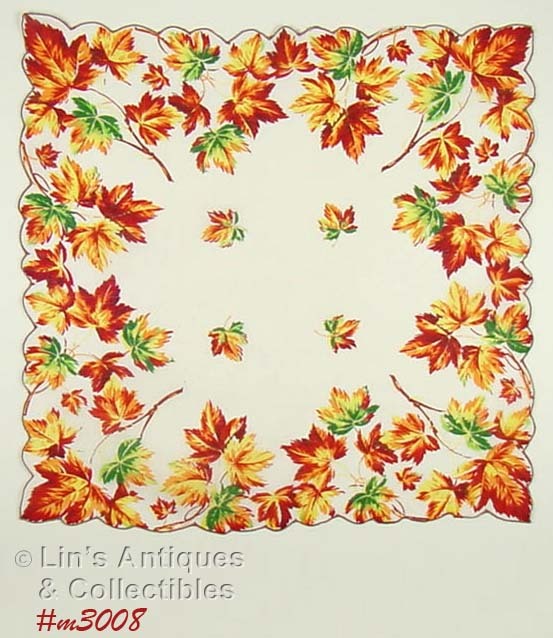 THIS HANDKERCHIEF IS WHITE WITH BEAUTIFUL OAK LEAVES! HANKY MEASURES 13 ¼” X 13 ¼” AND IS IN EXCELLENT CONDITION! 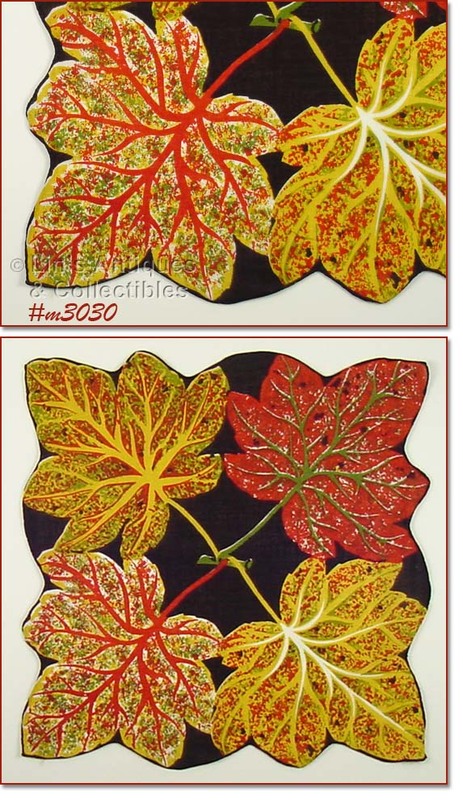 THIS IS ANOTHER SOMEWHAT UNUSUAL LEAVES HANDKERCHIEF! 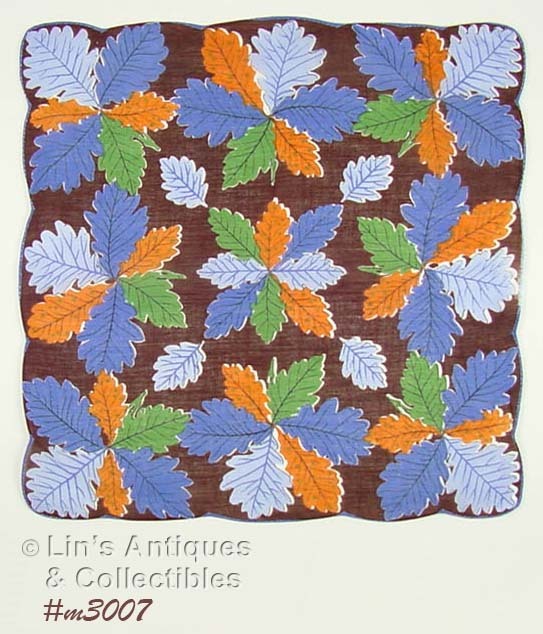 THE HANDKERCHIEF IS BROWN WITH A BLUE HAND STITCHED/ROLLED HEM AND THE PATTERN IS OF CLUSTERS OF COLORFUL LEAVES. HANKY MEASURES 13 ¼” X 13 ¼” AND IS IN EXCELLENT CONDITION! THE DETAIL ON THIS HANDKERCHIEF IS SO NICE! THE HANKY IS BROWN AND EACH CORNER HAS A LARGE OAK LEAF WITH THE HAND STITCHED/ROLLED HEM MATCHING THE SHAPE OF THE DESIGN. THE “STEMS” OF EACH LEAF ARE LINKED TOGETHER IN THE CENTER – UNUSUAL DESIGN. 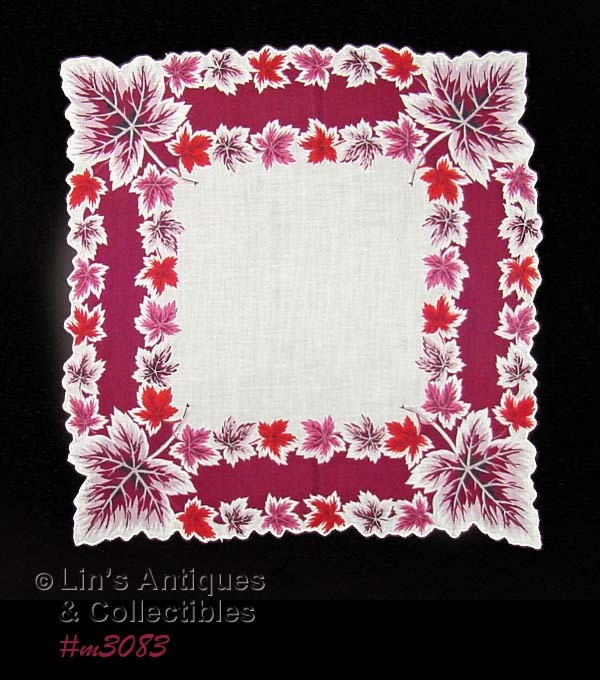 HANKY MEASURES 12 ½” X 12 ¾” AND IS IN EXCELLENT CONDITION! ANOTHER BEAUTIFUL HANDKERCHIEF WITH LEAVES! 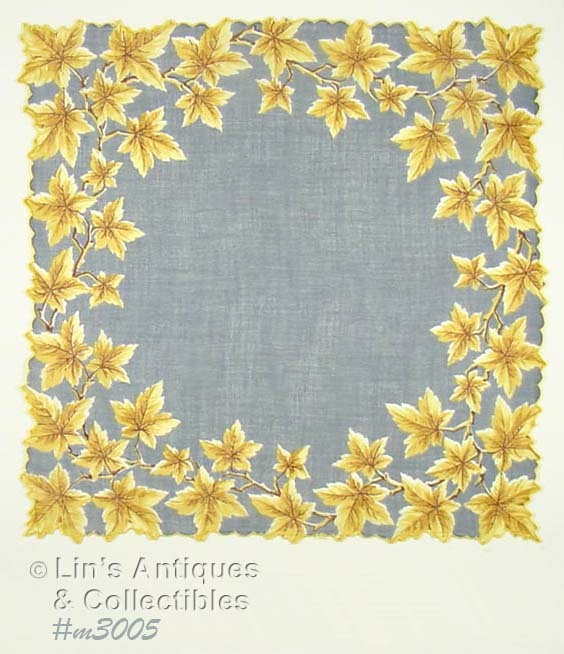 THIS ONE IS A PRETTY GRAY COLOR AND IT HAS YELLOW/GOLD COLOR OAK LEAVES ALL AROUND THE EDGE. HANKY MEASURES 13 ¾” X 13 ¾” AND IS IN EXCELLENT CONDITION!! THE BRIGHT, VIBRANT COLORS AND THE LEAF SHAPED EDGE CAUGHT MY ATTENTION AND THIS LOVELY HANKY HAS BEEN A PART OF MY COLLECTION FOR MANY YEARS. HANKY MEASURES 13” X 13 ¾” AND IS IN EXCELLENT CONDITION. 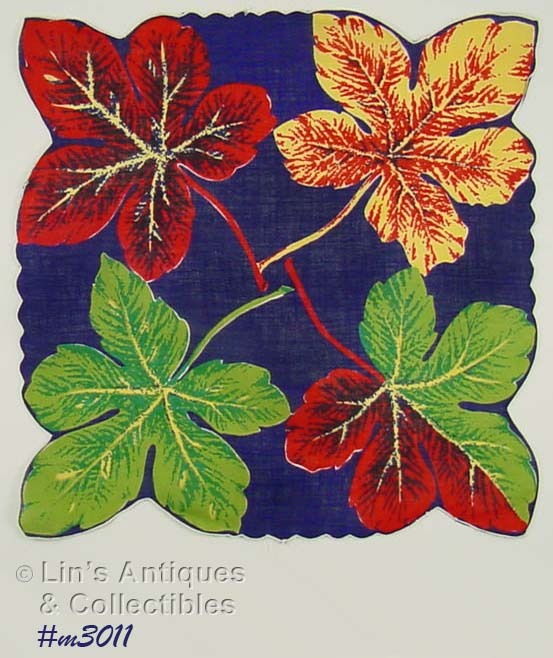 OF ALL THE MANY HANKIES THAT I HAVE COLLECTED AND/OR SOLD, THIS IS ONE OF THE MOST UNUSUAL – THE LEAVES ON THIS ONE ARE GRAPE LEAVES! 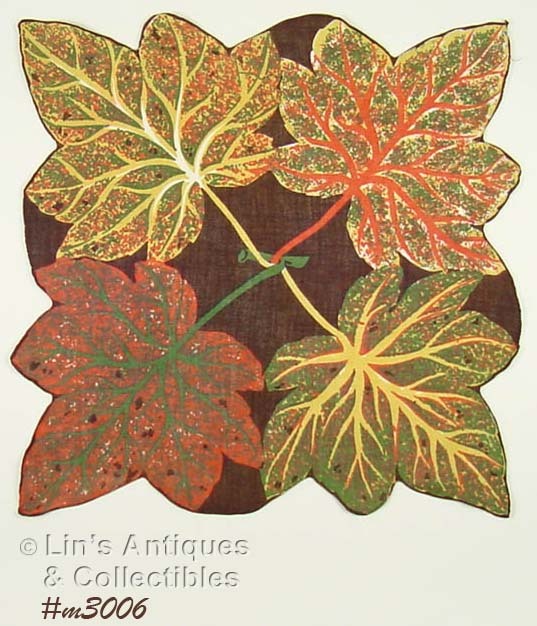 THIS ONE HAS BEEN IN MY COLLECTION FOR A NUMBER OF YEARS AND IT IS THE ONLY ONE I HAVE EVER SEEN WITH GRAPE LEAVES. HANKY MEASURES 13 ¼” X 13 ¾” AND IS IN EXCELLENT CONDITION!